a post like that was essentially boasting about about how much have have used. yes they may have had a genuine reason but there are many out there that just download the internet because they can and thats what essentially broke the pre-upgrade HFC network. I thought I was bad at 500gb/month 11tb is a good effort. I have been on FibreX for almost 2 months and it has been a rocky road. I have had a great run this month only 1 reboot so far. I have found its stable and as fast as advertised. 930/100 is great to wellington ex chch and 685/95 to Sydney is completely acceptable to me. Vodafone can not control outside of their network so complaining about slow speed test results to other carriers is pointless. Speed tests also do not show real world performance. I am more than happy with gaming and web browsing. 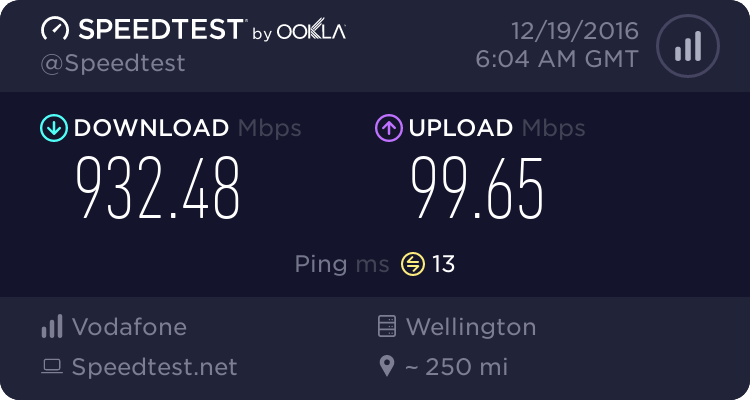 46 ping to Aussie sub 20 within NZ. Torrents at 85mb/s+ Steam 50mb/s+. All websites are very snappy compared to my work spark xDSL connections. FYI if your having issues look at the router. All my issues were fixed when I changed to pfsense. Speeds to google were initially able to max out the 100mbps or very close and then slowed down to 40-60mbps sustained. This may be because of the types of data at different parts of the transfer as well as other uses of the network taking priority. If you're interested I used 'rclone' running under the hood on my Netgear Nas (ssh) which synced the shares to google drive. I rate it as a good backup / sync option. Ran flawlessly through a few internet outages for over a month! Looking at scripting it to run nightly to sync new files and it supports most cloud services including Backblaze / Google / O365 / Dropbox etc etc. My previous sync to backblaze was very slow in comparison. How did you get unlimited storage on Google Drive? I pay $10/month for 1TB which just backs up my photos. Just want to pitch in my experience of last few days prior to the change out of the Vodafone provided HG659 wireless router with Mikrotik hEX. With HG659, our house experienced a constant lock-up whilst it barely doing any much more than DHCP and traffic routing - the WiFi is disabled on it. Each day we had upward of 5 reboots to get some stability with connectivity. Since with Mikrotik hEX installation yesterday, the performance had been superb! Highly recommended. Likewise - after using pfSense on an ancient PC for 10 years or so, I needed to upgrade for FibreX. Actually tried a Vodafone NetComm once - hung within a day, so I resurrected the PC (replaced the PCI network card). I tried the HG659, but it hung within the first day. My network hardware is in the attic, so not a good experience. I'm in the process of learning and how to configure the hEX to handle the Apple Airport Guest WiFi network on VLAN1003 based on this http://forum.mikrotik.com/viewtopic.php?f=13&t=100043&p=497333&hilit=apple+1003#p497333 but so far still trying to wrap my head on how to make it happen. If you got any pointer on how to achieve that configuration via WinBox GUI would be greatly appreciated - a step by step guide would be superb, so then I can "match" up what's in the RSC script and how they related to GUI. So my hg659 has not locked up ever, but the performance has been average. I swapped the switch connecting the machines together and that has improved things somewhat, next step is to try a different router. I'm am getting a lot of broken streams in YouTube and Netflix, and some of my devices have clearly lost their IP address when they went to sleep and take awhile to reacquire, but I don't know if that's faults in the kit/YouTube or the HG losing it's shift. I got the contract-referenced 200/20 out of the HG659, on wifi with a i7 laptop, while it was working. (As I do with the Mikrotik I replaced it with.) Perhaps your problems are caused by a fault in the cabling? A few years ago I had similar issues, and a tech replaced every f-connector from the top of the pole to the modem, and life became stable again. But isn't the RB750r2 only come with 100mb ethernet ports? On both of the fibreX offerings, you are seriously loosing out on the throughput. I did try out a much higher end Mikrotik and it was maxing out around 800mbps on my gig plan so I had to resort to a relatively grunty core i7 pfSesne build and its been chugging along perfectly at home and a much less powerful one for my parents place on their 200/20 plan. That would make more sense. Are you on the gig or 200 plan? 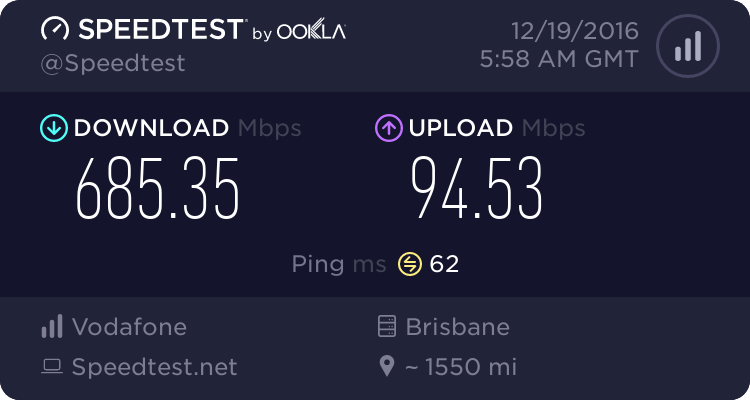 I would be interested to know what sorta speedtests you are seeing. I rack up a couple of TB a month without even trying on a slower connection, personally I don't see 11tb/month as that much for a gigabit connection. To put it in perspective, a gigabit connection can hit somewhere around 10TB per DAY as a theoretical max. I'd expect that we will start seeing users hitting 100+TB/month in the not too distant future. In related news, any ISP that offers an unlimited gigabit plan, and doesn't allow for heavy users that take that at face value, shouldn't be offering it. how can you do that with out trying though? you do realise that UFB, and HFC/Vodafones offering are all shared services, and while the max you may get is 1gbps the total bandwidth is only approximately 2.5gbps down for up to 16 users for a chorus UFB connection, so if everyone was downloading at the same time the max you would see is 155mbps. its also got nothing to do with the ISP, its to do with the service provider(LFC), isps only sell whay they are offered. If you are on a different fibre provider then the ratio could be 1:24 or 1:32.